On point: Midwood High School sophomore Jaclyn Khrol, who earned bronze at a Kansas City fencing competition earlier this month, celebrates with coach Misha Mokretsov. Two Kings County fencers scored big at a national tournament held in Missouri last weekend, including one freshman at a Windsor Terrace charter school who defeated grown men six years his senior, his coach said. “Skyler is only 14 and was having a blast fencing some of the best 17–20 year olds in the country, so when he beat them, he was ecstatic,” said New York Fencing Academy coach Misha Mokretsov, boasting of champ Skyler Liverant. Liverant, who started school at Brooklyn Prospect Charter High School earlier this year, earned fifth place in the Juniors category usually reserved for competitors four years his senior, and is now ranked number two nationally, putting him in the running for a national fencing squad to represent the United States at the 2019 Jr. Olympics, according to his coach. 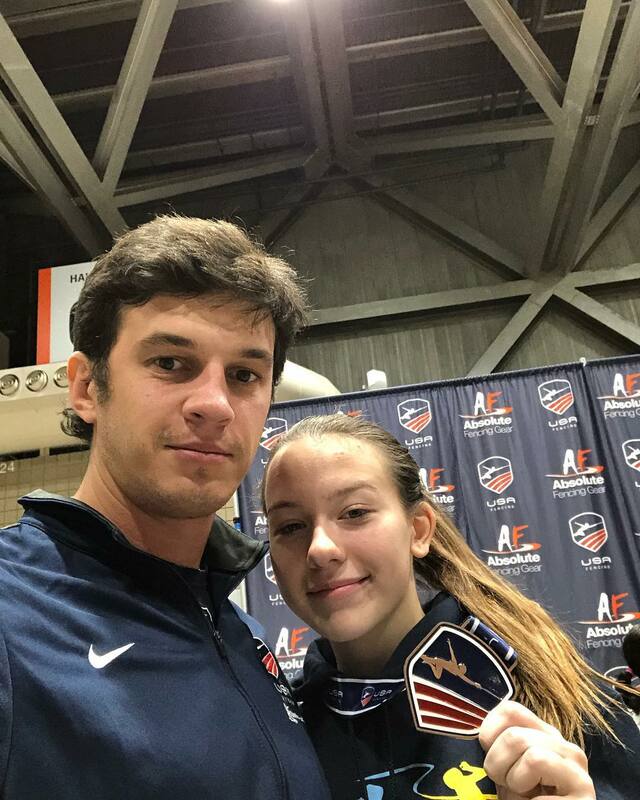 Midwood High School sophomore Jaclyn Khrol (inset with coach Mokretsov) also gave a stellar performance, earning bronze in Juniors just a week before the 15-year-old is expected to represent Team USA at the Junior World Cup fencing tournament in Puerto Rico. And Jaclyn’s sister, eighth-grader Caralina Khrol, seems to be following in her sibling’s footsteps, as the youngster took home a bronze medal in the under-14 group.